A triangular continuous random variable. As an instance of the rv_continuous class, triang object inherits from it a collection of generic methods (see below for the full list), and completes them with details specific for this particular distribution. The triangular distribution can be represented with an up-sloping line from loc to (loc + c*scale) and then downsloping for (loc + c*scale) to (loc+scale). 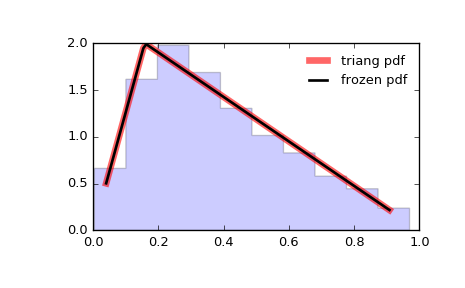 triang takes c as a shape parameter. The probability density above is defined in the “standardized” form. To shift and/or scale the distribution use the loc and scale parameters. Specifically, triang.pdf(x, c, loc, scale) is identically equivalent to triang.pdf(y, c) / scale with y = (x - loc) / scale. The standard form is in the range [0, 1] with c the mode. The location parameter shifts the start to loc. The scale parameter changes the width from 1 to scale.